Keep up-to-date on the latest happenings at Moran Vista by reading our community newsletters below. For more information on all we have going on in our community this month, contact us today. 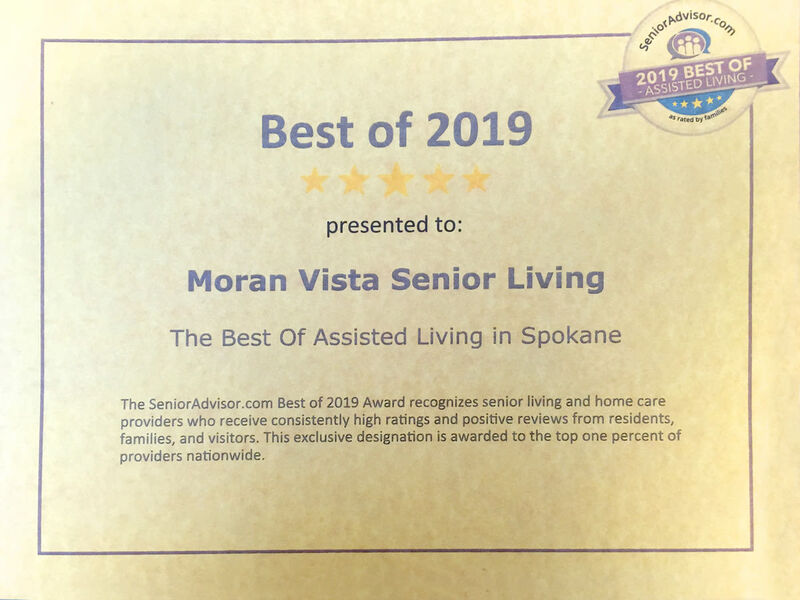 Senior Advisor.com recently ranked Moran Vista Senior Living as the best assisted living facility in Spokane—the only community to win anything in Spokane! Out of 200,000 separate care centers, they chose 45,000 to win awards all over Canada and the US. 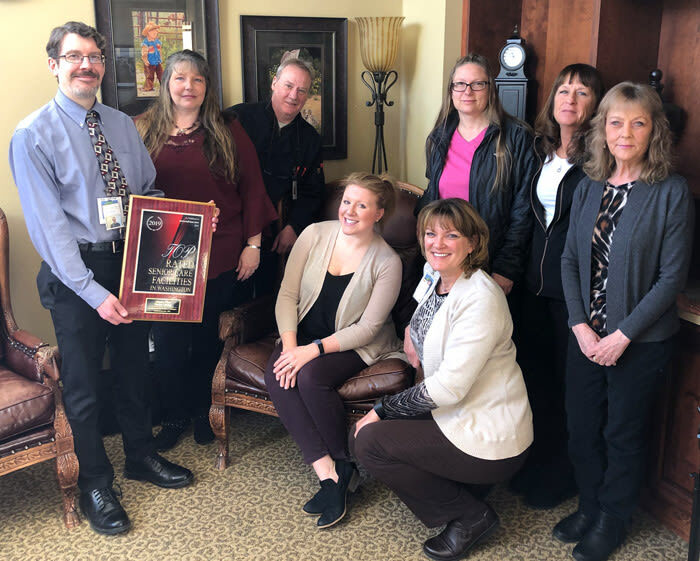 We received a plaque which is now located at the front office area to celebrate the award. A very special thank you to all of our wonderful team here at Moran Vista who do such a great job. 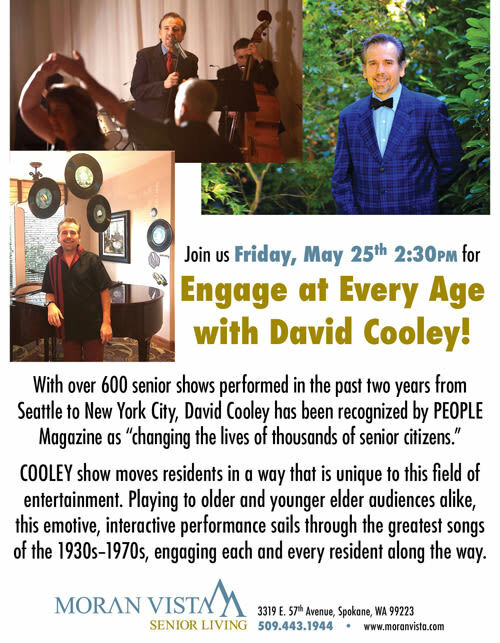 This is going to be a spectacular show! 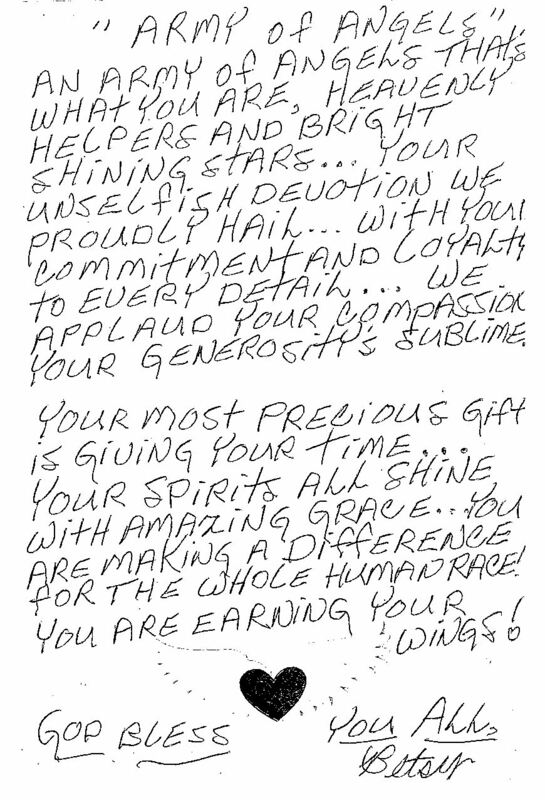 Thank you, Betsy, for your sweet note! Thank you to Chris N. for this great 5-star review posted on Yelp! Six months ago, my dad suddenly required a significantly higher level of care. 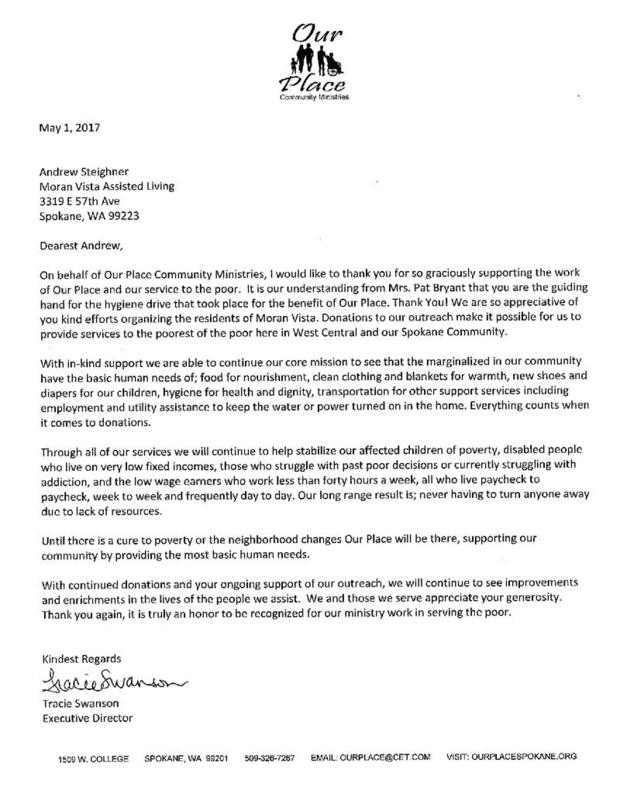 We are forever grateful that Moran Vista was able to accommodate all of his needs so that he could continue to live there. 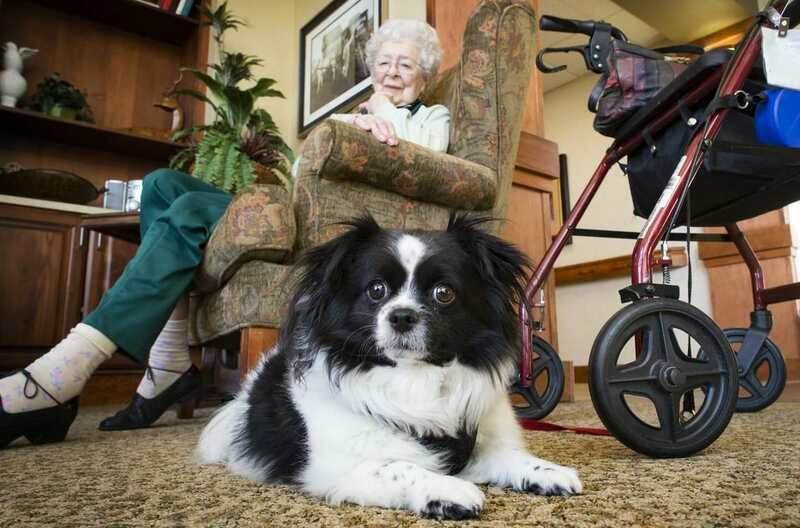 His wife was moved to the memory care unit. 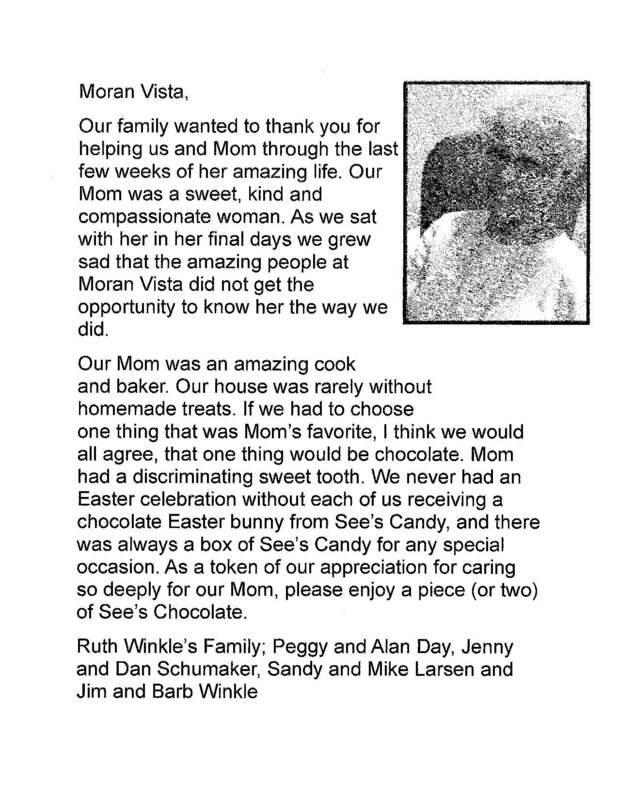 The staff took the time to make sure they had meals together and were able to hold hands every day. 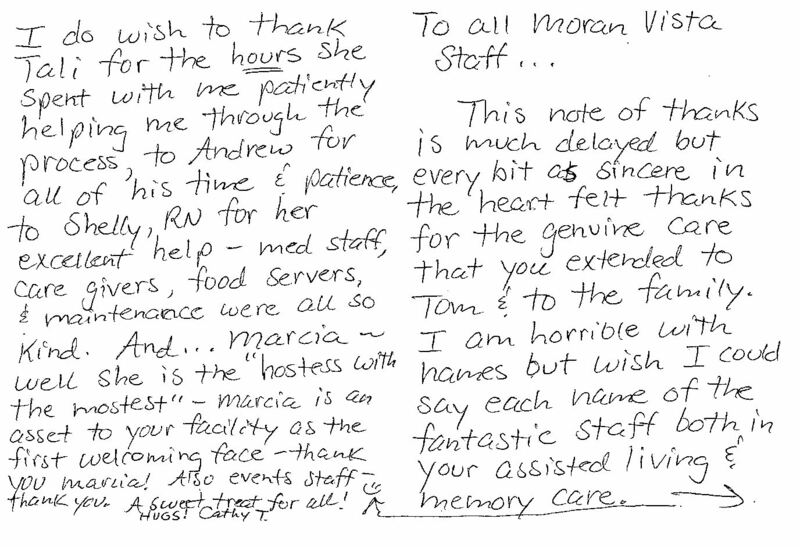 Moran Vista took care of both of them with grace and dignity. The staff is remarkable. There was not a dry eye when my dad passed away peacefully in Hospice care in his own bed. He was surrounded by people who genuinely loved and cared for him. I cannot say enough good about Moran Vista. The administrative staff has been very stable and were excellent communicators through our entire experience. This is the best place to spend the last years of life. I would not change a thing. WE HAVE A NEW NURSE! 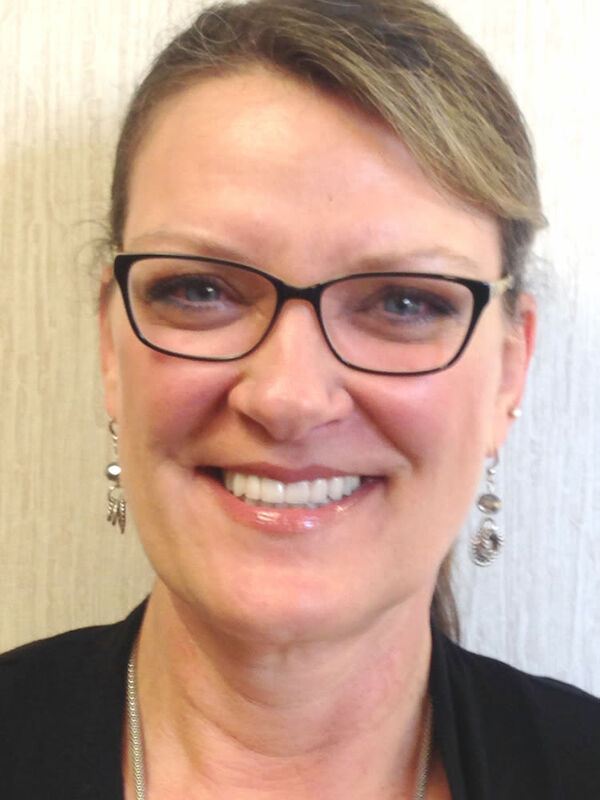 Moran Vista is proud to announce the hiring of our new community Registered Nurse, Shelly Broyles. Shelly has experience in senior community based care, and we are excited to have her as part of our team. Her office is located just inside the middle entrance by the medication room. Please take time to introduce yourself to Shelly. She will want to meet you all and is looking forward to meeting all the providers. I'd like to take a moment to say THANK YOU so very much to all of you who took such excellent care of my mom, Eileen H. And for caring about her & being her friend. I know I did not get to meet all of you in person, and I am not going to try to list names because I know I would not remember them all. But please know that I and my family truly appreciate you all! Speaking of family, both from things Mom shared with me in the past, and from what I saw and felt while there, I know that special bonds had formed between Mom and some of you guys. So thank you for being her extended family! I know it meant a lot to her. 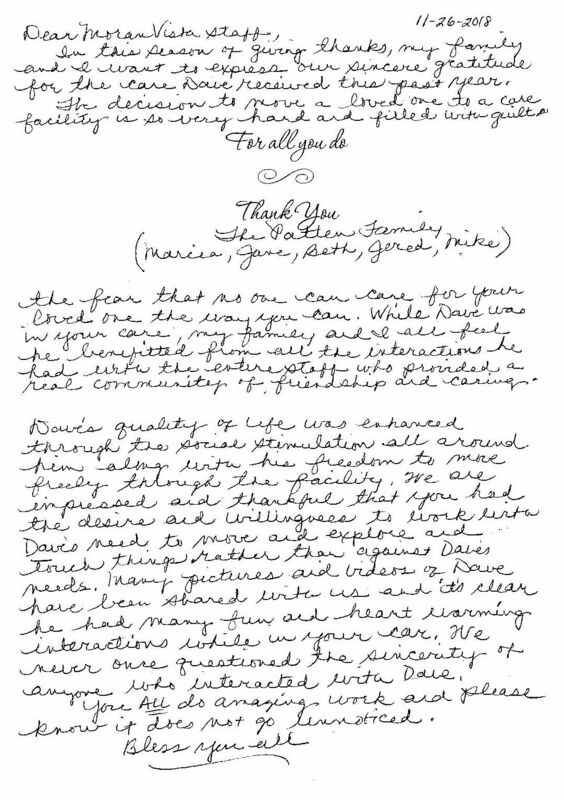 We are forever so thankful for your friendship, support and comfort of security for Mom Evelyn. She was such a lady and her spirit was so alive to the last minute of her life. These past months there seems to be a slower calm within the working people at Moran Vista. Andrew is determined and the hard work he puts in shows. Residents also see the difference. Thank you for the improvements. Andrew is an asset for all. THANK you and your staff for helping our Tuesday go well! My dad's procedure was straight forward. His biggest concern was how Virginia was doing. He was certain that she would be very angry when he returned. BUT, she had a GREAT day at Moran Vista! The anti-anxiety medication was key! All of us are very relieved and reassured that Moran Vista is the best place on earth for them right now! We cannot thank you enough. Also, my sisters and I are planning a birthday party for my Dad on October 14 and would like to have it at Moran Vista. Will you let me know who I should talk to about this and how to reserve a room for it? There will be about 10-15 people.